Java: How to add TextField (JTextField)in java? 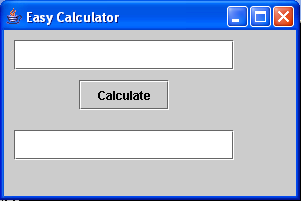 Suppose you are trying to prepare a Calculator using java programming language and also you are trying to prepare your calculator using JTextField (javax.swing.JTextField). Here I have given a little example how to use TextField (JTextField) of java in JFrame. Using the following code you will be able to learn how to put or use or show 🙂 TextField (JTextField) in java and how to position the TextField in JFrame. Previous postJava: Add value to a vector which is inside another vector.